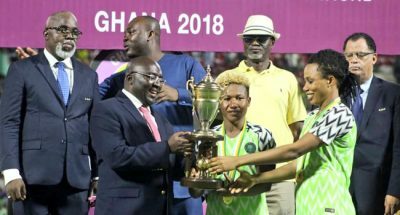 The Super Falcons of Nigeria have won their ninth AWCON title following a 4-3 win over South Africa after penalties in a tension soaked match. There were no goals during regulation time as both teams matched each other strength for strength all through 120 minutes. Asisat Oshoala missed an 83rd minute penalty but that did not stop the Nigerian team from being victorious as goalkeeper Tochukwu saved the last kick taken by South Africa. Onome Ebi missed the first spot-kick but South Africa also threw away their second penalty to bring the Super Falcons even in the match. Francisca Ordega was given the man-of-the-match while Thembi Kgatlana won the most valuable player award. Cameroon won the Fair Play award as they join Nigeria and South Africa to next year’s FIFA’s Women’s World Cup in France.